Lift off for VBS 2019 at Miraculous Mission: Jesus Saves the World! Get ready for liftoff with Concordia Publishing House’s 2019 VBS! With such a large and amazing world around them, kids might not always know where they fit in. At Miraculous Mission kids will learn about God’s creation of the universe, His love for those whom He created, and how He sent His Son on the ultimate mission to save us. Miraculous Mission is packed with new and exciting songs, activities, and skits for kids to celebrate the almighty power of God. Energetic and easy-to-remember songs like Cosmic Waves and Miraculous Mission, the 2019 theme song, will be a hit at VBS and remembered long after the week is done! VBS always starts and ends gathered at the cross to hear the Holy Word and learn that Jesus saved the world! At the opening and closing of Miraculous Mission, groups connect, pray, and sing to celebrate God’s awesome power and His love for us. The song-action videos, theme song, and Bible verses get kids and volunteers ready for the day. The opening and closing also will be a time to reinforce the Bible account and share this year’s mission project. This year’s mission project, titled Sharing God’s Miraculous Message, will focus on sharing the Gospel with kids who need to hear it, and is especially exciting because it features a book from a real NASA astronaut! Written by Colonel Jeffrey Williams, CPH will release in December 2018 The Work of His Hands for Kids, a children’s version of The Work of His Hands (CPH, 2010). The Work of His Hands for Kids will be sold in packs of 10 for $24.99 and will be a great way to get kids ready for VBS. By getting your students involved in this project, you will teach them—and the kids they help us serve—that God values all people regardless of race, ethnicity, or social status. You’ll teach that God reaches out especially to those who are suffering, that He doesn’t forget them, that He loves them. This year our all-inclusive VBS Starter Kit will be provided through USB drive, but still will hold the promotional videos, songs, and content necessary to have an out-of-this-world time at VBS! There also still will be six rotational sites, sample crafts, and other student materials just like in previous years, and our FREE VBSMate online registration tool! 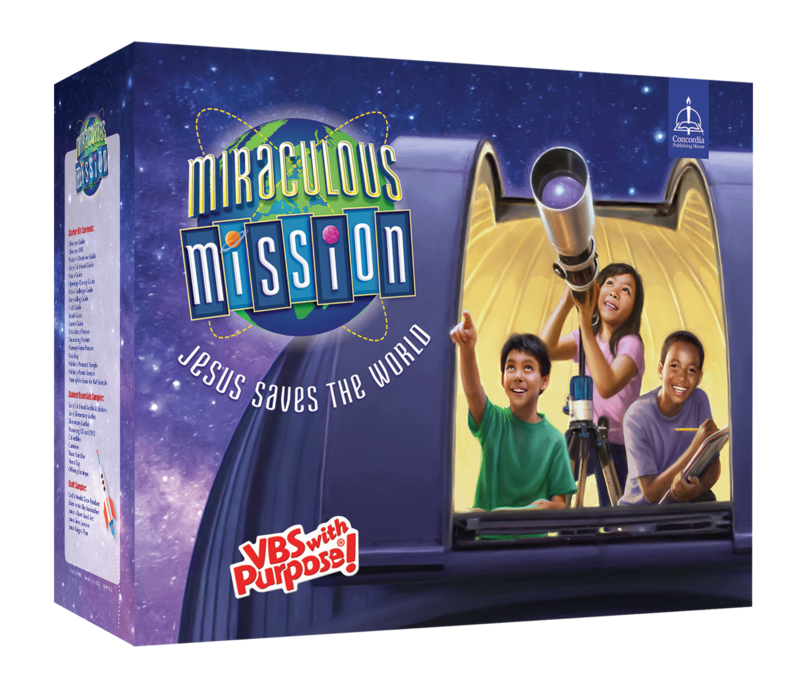 To explore 2019 VBS, preview the all-new music, and access free downloads, visit the Miraculous Mission website at miraculousmission.cph.org, and follow VBS at facebook.com/CPHVBS, Twitter @CPH_VBS, and Pinterest for videos, tips for snacks and activities, and more! For more information, contact Lindsey Martie, Public Relations, by phone at 314-268-1303 or by email at Lindsey.Martie@cph.org.